You can use images from any format including JPG/JPEG, BMP, PNG, GIF, etc. There are just so many popular images available on the web, but only GIF format supports animation. So if you saved lots of images in JPG, PNG, TIFF, BMP, etc. on your computer. But you have been unable to create a GIF with existing tools. 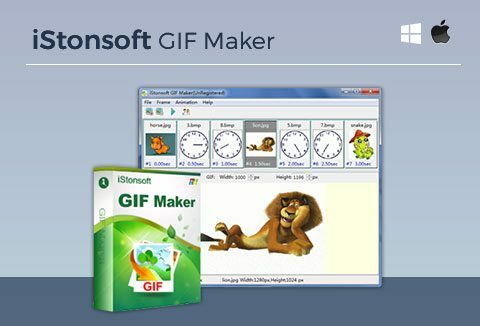 But this GIF maker software is different. 3 different ways to import images in various formats like JPG, JPEG, GIF, PNG, BMP, etc. into the program for creating. Produce high quality and impact GIF images from these imported images which take less disk space. Create your GIF in just 3 steps: Import – Customise – Create. This tool has one of the most intuitive interfaces. You don't need to refer to help documents to get your way around it. Click and you are good to go. Add, delete or duplicate frames and adjust orders according to your own needs. Customise the output GIF images. Be it re-sizing it, and adding effects or time delays... whatever the case. Preview optimised GIF pictures frame by frame and adjust the optimisation options if needed. Change image positions by directly dragging and dropping any picture to your desired position. After loading pictures, you can select the concerned proportion of an image, and then edit, cut, copy, crop or clear the selection based on your own needs. You’re allowed to set transparency colour to all your loaded images at a batch or partially. Loads of Shortcut keys are supported. So you can continue to use some of your favourites like File Save to save it, or use the Ctrl+S shortcut key directly. Compatible with all Mac and Windows operating system. Select the version you want from the options given below Add To Cart button. Delivered as an instant download once you place your order. Available for Mac and Windows OS. You get support from the vendor via email. A LOT OF FUN…. I like it because it made a lot of my FRIENDS LAUGH! !